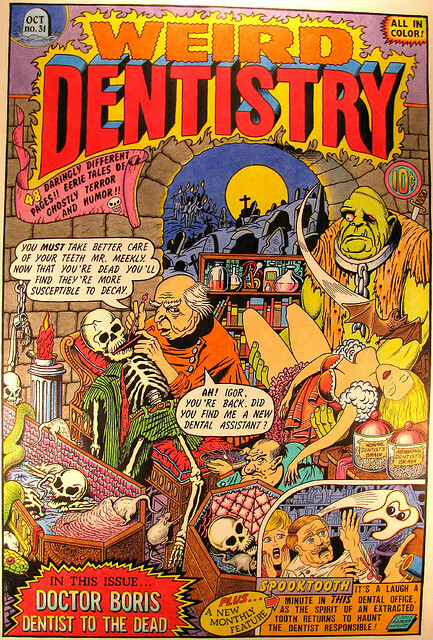 Here’s another great dental comic book cover that will help get you in the mood for Halloween. Doctor Boris a.k.a. “Dentist for the Dead” sure has some cooperative patients for being such a creepy guy! These images are provided courtesy of the artist, Robert Weilert. He has many more covers styled after the art produced during the “Golden Age of Comic Books” (late 1930s to early 1950s). Click on the image above or the link below to see more of his splendid dentistry-themed artwork. © Property of Robert Weilert. All rights reserved.